Skinny Noodles is now offering a Trial 10-pack of our Skinny Shirataki Noodles & “Rice” perfect for those who are trying shirataki noodles for the first time or shirataki noodle fans looking for product variety at a great value. Skinny Noodles are quickly gaining popularity because of their versatility and health-promoting benefits. Made from konnyaku or konjac, a root native to Asia, they are a natural, gluten-free and soy-free pasta substitute. Low in calories and high in filling fiber, shirataki noodles have been touted as one of the best foods for weight loss, and with virtually zero carbs, they are also diabetic friendly. The Skinny Shirataki Noodles & Rice Trial 10-Pack is our best value trial pack priced at only $29.98. Skinny Noodles are quick and easy to prepare. They have a 12 month shelf life. For best results, we recommend storing them in the refrigerator. For cooking tips and meal ideas, be sure to check out our recipes page. Order our Skinny Shirataki Noodles & “Rice” Trial 10-Pack today so you can eat the foods you love and lose weight! Every order ships for free. There is a strong debate happening over whether or not shirataki noodles are paleo-friendly. Depending on your individual interpretation of what a paleo diet is, the answer to the question “are shirataki noodles paleo?” can vary greatly. Read on to learn more about shirataki noodles, the paleo diet and whether or not they are a match made in healthy eating heaven. Built upon the belief that the healthiest way humans can eat today is to eat the way actual cavemen did, the paleo diet focuses on consuming only whole foods – unprocessed, anti-inflammatory foods containing no added sugars, preservatives, flavors, or colors. If a food cannot be found growing naturally or consumed without heavy refining and processing, it’s not paleo. Cavemen existed before the introduction of food processing, so if they didn’t eat it, chances are it’s been altered in some way. Eating paleo also means avoiding eating foods that contain gluten such as pastas, breads and crackers (just to name a few) because of gluten’s inflammatory effect on the body. A fairly new food in the USA, shirataki noodles are quickly gaining recognition as one of the best foods for weight loss and overall health. Shirataki noodles are a natural food made from Konnyaku, a root native to Asia, and are used as a substitute for starchy grains and pasta. Because shirataki noodles have zero net carbs, no fat and are high in fiber, they have become a popular choice amongst those trying to lose weight, as well as diabetics needing to control their blood sugar levels. It is recommended that shirataki noodles replace high-calorie, starchy foods such as pasta, white rice, potatoes and bread. Shirataki noodles are a natural, gluten free food containing no preservatives or added sugar. Sounds pretty paleo right? So maybe you’re wondering what all the fuss is about. People who say that they aren’t paleo-friendly argue that because they don’t occur naturally, it disqualifies them from being a paleo approved food. Now, this is where individual interpretation comes into play. If you choose to live a strict paleo lifestyle, then perhaps you will agree with the idea that shirataki noodles are not a paleo-friendly food. But to us, that seems a little like splitting hairs. 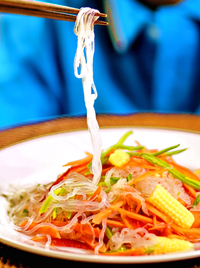 If you choose to follow a paleo diet because of its overall focus on avoiding highly processed, gluten-rich, sugary or preservative-filled foods, then you can see that shirataki noodles deserve a place on your plate. Having an open mind and a little wiggle room when it comes to the rules, lets you incorporate this versatile, waist friendly, health-promoting food into your eating plan. Some say shirataki noodles have a “rubbery” texture, which can be reduced by pan frying or boiling the noodles for 2-3 minutes but, with their growing popularity, various brands have begun adding tofu to their products to change the texture in hopes of appealing to the masses. Shirataki noodles containing tofu (processed soy beans) are undoubtedly not paleo-friendly, however there are many brands that continue to produce this superfood the same way it’s been made for centuries – without the addition of tofu. When purchasing shirataki noodles for a paleo lifestyle, be sure to read ingredient labels and steer clear of products containing tofu. Skinny Noodles is a leading producer of traditional, soy-free shirataki noodles that are made right here in the USA. Please visit Skinny Noodles for more information about shirataki noodles and how they can help improve your health. Be sure to check out our recipes page for delicious, easy-to-make noodle meal ideas!